HyINTEGER is an acronym which stands for: Investigations on the integrity of wells and technical components exposed to highly corrosive conditions in geological hydrogen underground reservoirs. The research project, approved for three years, is funded by the Federal Ministry for Economic Affairs and Energy (funding number: 03ET6073). 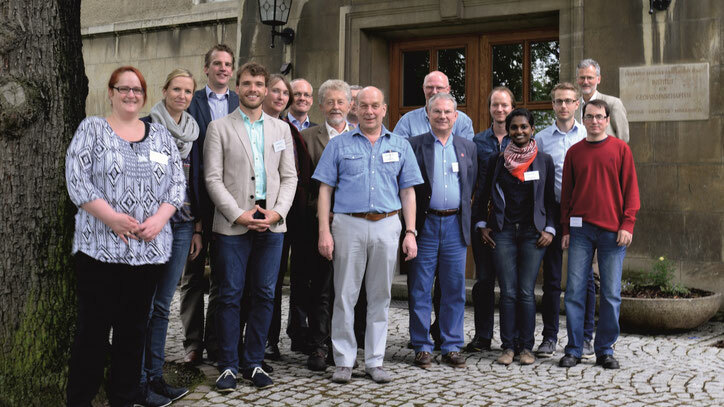 The third-party financed project is made up of five subprojects, coordinated by the Institute of Geosciences at the Friedrich Schiller University Jena. The five subprojects are comprised by national and international research institutions and universities. The focus of the project partners are the inorganic, organic microbiological and petrophysical reservoir characterizations as well as simulation and modeling approaches from pore to reservoir scale. For further information, suggestions or questions please click here. One of the key challenges in the implementation of the ambitious energy and environmental policy goals of the German government in the so called "Energiewende" is the allocation of sufficiently, constantly and safely produced energy for the population and industry. Important resources of regenerative energy are wind and solar power plants, which both depend on the prevailing weather conditions and their (partly strong) fluctuations in energy production. Thus require a considerable expansion of the storage capacity for a required stable energy supply. A promising solution for this problem could be the electrolytic conversion of electrical to chemical energy, combined with storage in geological structures. The electrolysis produces hydrogen, a high energy carrier, which is potentially storable. Geological structures in the underground, e.g. depleted natural gas reservoirs, saline aquifers and salt caverns offer the possibility of storing hydrogen-containing natural gas or even gas mixtures of hydrogen and CO2 as well as pure hydrogen. The here presented project has been launched in January 2016 within the framework "Research for environmentally-friendly, reliable and affordable energy supply" by the BMWi. The aim of the project is to investigate the interactions between the technical facilities for hydrogen storage in the geological underground in a highly corrosive, highly saline environment. Therefore material, engineering and geoscientific methods will be used. Both the chemical-mineralogical, microbiological and petrophysical-geohydraulic-geomechanical properties of the reservoirs and cap rocks will be investigated, as well as the stability and tightness of the technical facilities. If necessary, these infrastructures will be new or further developed.